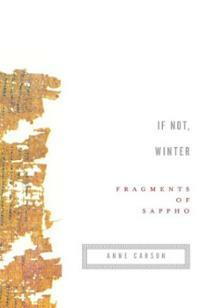 If Not, Winter is a collection of all the fragments of poetry that remain from Sappho’s great body of work. Sappho was a singer and songwriter on the island of Lesbos, a woman who explored love with both men and women (and hence the origins of the word “lesbian” and “sapphic”) and whose fame and voice have lasted now through over 2,600 years. Her songs were recorded on papyri and much of it remains in tact only in part. Only one song remains in full. In this collection, Anne Carson has translated the fragments from papyri, as well as bits of song referred to by direct quote in other ancient sources. The book is presented in two languages, with the Greek on one side and the translation on the facing page. Where pieces are missing, that space is denoted by brackets. This was a fascinating reading experience. I’ve never been much into poetry, you all know that, but this was different. Jason told me about this edition years ago, but I didn’t understand when he said that all the white space and fragments painted a picture for you. I didn’t understand how the white space was put together to be part of the poem. Now, I understand, because each one of these fragments tells a story. The story, of course, is incomplete, and I’m sure every reader will have a different interpretation of them. When all a poem says is “you burn me” (poem 38) or “we shall give, says father” (109) or “Leto and Niobe were beloved friends” (142), it’s almost like a writing prompt that just lets your imagination run with what might be. It was wonderful! What sort of story does that call to mind for you? It’s so intriguing. It makes you dig into the space around it to try to find what Sappho was trying to say, especially when you start noticing patterns. For instance, there are four poems where she mentions her friend Atthis, a woman with whom it appears she had a romantic relationship, and a stormy one from the fragments I read. Or, at least, that’s my interpretation – because every interpretation is likely to be different. Isn’t that just fascinating?? Wouldn’t you love to know the story behind that, to know what fills up those empty spaces? And then to see the Greek side by side with the English, more Greek letters than English, but not enough that a full word can be translated, so that it shows as only blank brackets on the English side. This entry was posted in 2010, Adult, Poetry and tagged classics, favorite, LGBTQIA, translation. Bookmark the permalink.